Jim Ellermeyer discusses the difference between Pleasure and Joy. Why is Pleasure so hard to pursue and can get us into trouble and the sustainability of Joy. 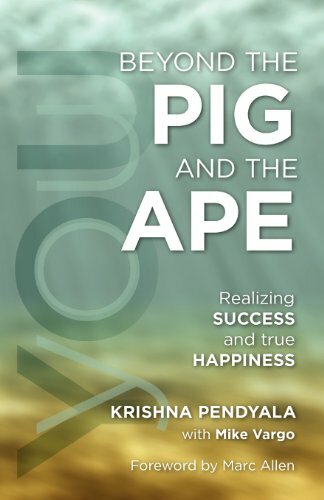 We look at Krishna Pendyala’s take on "The Pig and the Ape” from his book. Learn more about "Beyond the Pig and the Ape"! Buy the book via Amazon! "So, there’s a friend of mine. He’s a good friend of mine. I’ve spoken to him many times, and he’s an individual by the name of Krishna Pendyala. He has written a book called Beyond the Pig and the Ape realizing success and true happiness. So, when we look at pig, it’s pursuing instant gratification. And, for many people, instant gratification equals pleasure, does it not? And, also what we do – the ape is avoiding painful experiences. So, for those of you out there who are unfamiliar with Krishna’s work I would suggest that you perhaps pick up this book and read it, and it will really give you a distinction between how we search for instant gratification believing that it is going to make us happy and joyful, and avoiding painful experiences."